June 20, 2018 Dan O. Always depend on the white dude to save the day! Mason (Jon Hamm), at one point in his life, was living a pretty good one. He was the U.S. diplomat of Beirut, he had a lovely wife, kids, and plenty of friends to go around. However, one fateful night, it’s all taken away from him when a gang of terrorists infiltrate his home and kill his family. Now, many years later, Mason is being brought back to the city he once abandoned to save an old colleague of his (Mark Pelligrino), who is being held hostage by terrorists, possibly the same who killed Mason’s family many years earlier. However, with so much interest between the U.S., especially during the Lebanese Civil War, Mason ends up coming between many different sides of conflict, never knowing which one to choose, who’s the most trustworthy, and most importantly, whether he can actually make it out of this situation alive and in one piece. Cheer up, Jon. There’s a razor and shaving-cream just waiting for ya when you’re done. I must admit, watching Beirut after Entebbe probably helped its chances. Sure, the movie’s far more efficient, exciting, and smarter than the later, but mostly, it works in the same vein; a retro-thriller that takes place on foreign-soil, where warring factions and governments clash at the center of a hostage-situation. Beirut is much classier and clearly the better of the two, but does it have much else more to say than Entebbe? Mostly, it’s just another one of those thrillers that likes to think it can make sense of other countries’ conflicts, how the U.S. has always find ways to dig its nose into all of them, and how it takes a white savior to shake things up and allow people to really see what the problems in this world are. So yeah, it’s a lot hokier and sillier than you’d expect, but director Brad Anderson does a solid enough job of hiding all of the small issues and cracks within the system and keeping things moving, even when the screenplay by Tony Gilroy can’t always make sense of itself. Still, it’s quick and entertaining enough to work, so really what’s the problem? Thrillers like this get by on the fact that they take themselves somewhat seriously, but by the same token, also revel in the thrills and chills of trying to throw all sorts of curve-balls at you, without any of them really making sense. So of course, double-crosses occur, real motives come to play, and characters reveal their true-identities by the end, which is all goofy, but hey, at least it’s doing something, right? Another retro-thriller starring Rosamund Pike. Maybe she needs a new agent, too? Also, coming from the writer of the Bourne franchise, I wouldn’t expect much sanity and coherence. 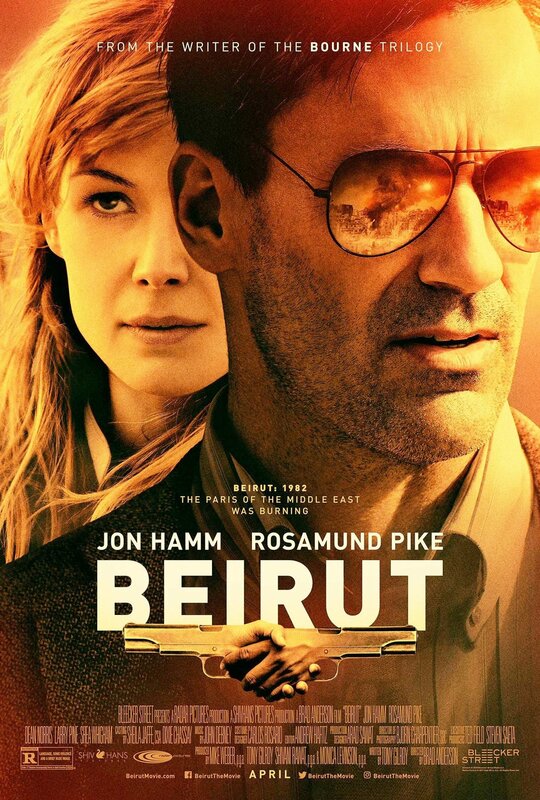 That said, the real reason Beirut works as well as it does is because Jon Hamm’s finally given a worthy enough role as the lead here as Mason. It’s been an odd, rather weary road for Hamm since Mad Men ended; when it was on, his career was on-fire and he was able to navigate between TV and film quite exceptionally well. Now, it seems like Hollywood doesn’t know what to do with him – he’s so handsome and dapper that they want to cast him as a smooth, charming and cunning leading-man in the vein of Gable or Grant, yet, they don’t know where to put him. Finally, Beirut sees Hamm not only playing up to his strengths as the most charming guy in any room, but the smartest, even if there are some warts to his general persona. Here’s to hoping that maybe Hollywood can figure out something to do with this man and his career, because what a waste it would be for him to just sit around and wait for the next acclaimed-series to fall on his lap. I mean, I can wait for that. I don’t know if he can, so get to it, Hollywood! Consensus: Though it’s not without its flaws, mostly coming from its inherent silliness, Beirut is a fun, competently-made thriller that finally shows what can happen when Jon Hamm is given something to work with. An ad man and two FBI agents. Conspiracy?